Do Dementia Symptoms Get Worse in Springtime? As many caregivers know, dementia symptoms don’t always stay at the same level. Many seniors have mild dementia that seems to come and go. The condition can get significantly better for a few months and then take a surprising turn for the worse. New research shows this change might be related to the shifting seasons. Here’s what you need to know about the link between dementia symptoms and springtime. There’s quite a bit of scientific evidence supporting the idea that depression gets worse in the spring. A 2019 study headed by Columbia University looked at 3,353 participants over the course of multiple years. They found that more dementia diagnoses happened in spring than in fall or summer. The spike in diagnoses seems to happen because symptoms are worse at that time of year. The researchers discovered that seniors both with and without dementia had significantly worsened cognitive function and memory skills during the spring. This information can be quite helpful for both family members and professional caregivers who care for seniors with dementia. Even when families have the best intentions, caring for a senior loved one with dementia can be challenging. Fortunately, Home Care Assistance is here to help. We are a leading provider of dementia care. Sacramento families can take advantage of our flexible and customizable care plans, and our caregivers always stay up to date on the latest developments in senior care. Mental health experts theorize that worsening dementia symptoms during spring are due to the body’s response to light. The human body responds to sunlight by producing many chemicals it needs to function properly. In wintertime, when it’s darker, there tend to be greater rates of depression, schizophrenia, and other mental health disorders. In seniors with dementia, the issue seems to be that seasonal shifts affect the body’s ability to express certain genes associated with brain health. Every senior is different, but in general, those with dementia may face a little more difficulty during late winter and early spring. According to recent research, the biggest issue seems to be with cognition, not memory, which means seniors are more likely to have difficulty thinking instead of recalling things. Caregivers may find their loved ones get a little more agitated and are easily upset when things go wrong. Seniors might have a bit more difficulty with multistep tasks like following recipes, getting ready to go somewhere, or putting together a wooden model. Dementia isn’t likely to be extremely worse in the spring, but the difference may be noticeable. No matter what time of year, trained caregivers with experience in caring for seniors with dementia can be a fantastic resource for family members. Families looking for top-rated Sacramento home care service providers can reach out to Home Care Assistance. From respite care to specialized Alzheimer’s, dementia, stroke, and Parkinson’s care, there are many ways we can make life easier for seniors and their loved ones. What does all of this mean for you and your senior loved one? It might seem worrying to think you can expect worse symptoms during spring, but knowing about this problem is actually a good thing. For example, it may be possible to use light therapy to alleviate dementia symptoms. 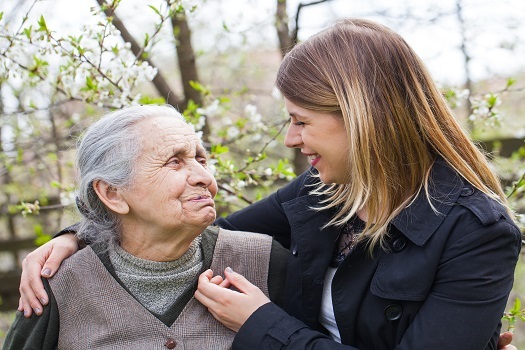 Since more symptoms are present during springtime, this is the ideal time to get a dementia screening and see if your loved one is in the early stages of dementia. Since seniors are likely to function better in summer and fall, those may be the best times to schedule family meetings, holiday celebrations, and other important events. If you’re caring for a loved one with dementia, these findings may help you manage his or her care more effectively. Caring for a senior loved one can be challenging for families who don’t have expertise or professional training in home care, but this challenge doesn’t have to be faced alone. Family caregivers can turn to Sacramento Home Care Assistance for the help they need. We provide high-quality live-in and respite care as well as comprehensive Alzheimer’s, dementia, stroke, and Parkinson’s care. Call one of our dedicated Care Managers today at 916.706.0169 to learn about the high quality of our in-home dementia care services.